This week has been jam-packed with glitzy vehicular unveilings. Jaguar spectacularly suspended its new XE model from a helicopter over the skies of London on Monday night, while Mercedes and its tuning division AMG chose the slightly less shouty surroundings of the German countryside to reveal its brand new performance machine yesterday. 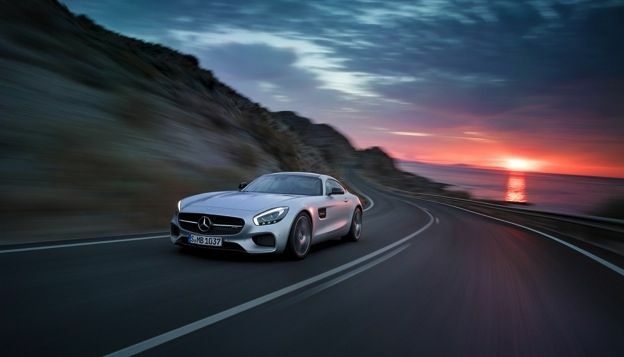 The AMG GT is only the second vehicle to be manufactured in-house by Affalterbach-based tuning firm AMG, following in the footsteps of the almightily powerful and almightily expensive gullwing-door SLS AMG model a few years ago. An entirely fresh styling approach has been taken with Mercedes' latest racer, with designers keen to de-clutter the exterior to keep it pure and flowing. A typically elongated Mercedes bonnet greets those first glancing at the AMG GT but it soon swoops into elegantly simple flanks and brilliantly aggressive rear haunches. A beautiful machine to gawp at, we think most will agree. Underneath that massive nose sits a brand new 4.0-litre V8 engine that develops a staggering 456bhp in the 'standard' GT models and a slightly terrifying 503bhp in the highly tuned GTS versions. Opt for the latter and you'll see the TFT display speedometer rise to 62mph when the right foot is pinned to the floor from a standstill in just 3.8 seconds and go on to a very illegal 193mph top speed soon after. All of this snarling grunt is driven through a revised seven-speed semi-automatic gearbox that can be operated via a pair of ergonomically designed aluminium paddles located behind the steering for true Formula 1-style cog swaps. The attention to detail and simplistic design continues inside, where a new cockpit sees the dash wrap around its two occupants like a jet fighter. This places all of the important dials and switches directly in reach of the driver, allowing for vehicle settings to be altered even at maximum attack track pace. A sleek 8.4-inch central display controls a number of infotainment functions, which includes the Mercedes COMAND system that can be found in the new S-Class. Occupants will be able to tether smartphones, access designated Mercedes apps on the move, enjoy the rich sound of an optional Burmeister stereo and download travel and weather information from the web. The centre console has been arranged so all of the important switches are aligned in a 'V' formation around the LCD screen, mimicking the cylinder layout of the bellowing V8 engine. But perhaps the most interesting switch is the one labelled DYNAMIC SELECT - thumb this and the flaps on the AMG performance exhaust system open for a truly hell raising engine note. Prices are rumoured to start at around £95,000 when it goes on sale early next year, putting it in the ring with the Porsche 911 Turbo, Jaguar F-Type R and Audi's upcoming refreshed R8 model. It's going to be a noisy battle but the Mercedes-Benz AMG GT, with its stunning styling and impressive performance figures, certainly has a fighting chance.